British singer David Bowie released his first new song in nearly a decade on Tuesday in a surprise launch coinciding with his 66th birthday. "Where Are We Now? ", produced by long-term collaborator Tony Visconti, is a melancholic look back to the time Bowie spent in Berlin in the 1970s with an accompanying video featuring black-and-white footage of the city when it was still divided. 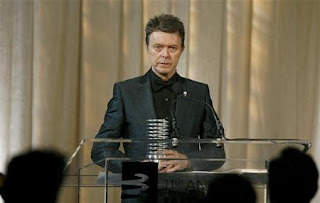 The song, available on iTunes and free to view on his re-launched website, was recorded in New York and will be followed by Bowie's first studio album since 2003, "The Next Day", due out in Australia on March 8 and the United States on March 12. Fans welcomed the return of one of pop music's most gifted and enigmatic figures, and the hashtags #Bowie and #DavidBowie were trending on Twitter following the announcement. Early reaction from the public was mixed, but critics were largely impressed. "Plenty of veteran musicians are masters of the cunning trick of staying away just long enough for every comeback to be hailed as a return to form, regardless of its true quality," wrote David Smyth of London's Evening Standard. "Bowie's new song - Where are we now? - is free of such bluster - it's gentle, elegiac and stunningly beautiful." The artwork for the album appears to be based on that used on "Heroes", Bowie's acclaimed 1977 record that was the second album in his so-called "Berlin Trilogy". The typically understated associations with the singer's past have prompted the music press to speculate that he may be returning to the German cycle. As yet there is no word on whether Bowie will tour to support the album, or on the identity of the mysterious woman whose face appears in the new video alongside that of the singer. Bowie's label Columbia Records said the new song was a "treasure" that appeared "as if out of nowhere", underlining the element of surprise. "Throwing shadows and avoiding the industry treadmill is very David Bowie despite his extraordinary track record that includes album sales in excess of 130 million not to mention his massive contributions in the area of art, fashion, style, sexual exploration and social commentary," the label said. The album will consist of 14 songs, and a deluxe edition will feature three bonus tracks. The glam-rock star, born David Jones in south London in 1947, shot to fame with "Space Oddity" in 1969, and later with his alter ego Ziggy Stardust, before establishing himself as a chart-topping force in the early 1980s. His long absence from the music scene led to speculation that he had retired, with British newspapers reporting as recently as October that he had disappeared from the limelight for good. Bowie's last album of new material was "Reality", released a decade ago, and he underwent emergency heart surgery while on tour in 2004. His last stage performance was as a guest at a charity concert in New York in 2006. Known for his constant desire to re-invent himself and experiment with different musical and fashion styles, Bowie is considered one of the most influential stars of the pop era. London's Victoria and Albert Museum is staging a major exhibition dedicated to Bowie, which opens on March 23.